John Carmack and the tech team at Id have delivered the tech to make Rage run smooth but I dug the crazy characters and engineering items the most. A lot of talk this E3 was how Id was able to wrangle 60 frames per second out of the Xbox 360 hardware for its first shooter in over five years. 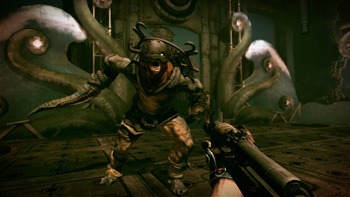 Truth be told, Rage looked really good in all of its brown and black glory. Bethesda showed the game on a huge Panasonic flatscreen and the combat animations didn't skip a frame. But not only is the tech impressive, there are a lot of interesting gameplay wrinkles in this game that will hopefully make Rage a memorable experience. The demo started out with an introduction to the kind of characters you meet after your Ark touches back down to Earth. The quick storyline is that humanity had created pods that launched into space when a comet hits our planet. These Arks were supposed to ensure the survival of the human race, and repopulate the planet, but when you emerge from your Ark, you find that not everyone was killed and some have mutated into feral mutants. Not all the humans are unfriendly, the first guy that we met was named Crazy Joe and he had some tales to tell of the "Authority" and what they've been doing to the mutants, making them stronger. If that doesn't give you a hint of what the overall story arc and endgame will be about, then you certainly haven't played enough games. Still, the demo for Rage had some surprises up its sleeve. Stepping out of Crazy Joe's hut, you find that mutants are messing with your buggy. The developer piloting the demo (Jason Kim, Senior Producer) took a few potshots at the mutant with a pistol, but then quickly unloaded a rotating blade Frisbee thing and beheaded the mutant at range. Jumping into the buggy, we started racing to the town of Wellspring. Matt Hooper, Design Director of Rage, said that the demo took place a few hours into the game, after you had assembled your first buggy and equipped it with machine guns and some shielding. Good thing, because as soon as we hit some open ground, we are attacked by some bandit clans in their own buggies. The machine guns start blazing, and there is some cat and mouse as we drive around a rocky promontory to try to flank the two buggies. The whole fight takes less than 60 seconds, but Hooper assures us that it would have taken much longer without the machines guns. We make it to Wellspring, where the guard asks us our business. Hooper explains that this is the kind of story-telling that Rage aims for; by the guard simply remarking that we are a stranger here, we get a lot of story information. I'd believe him except that I've played about 40 other games in which you play the outsider or stranger and it's so common now that it's almost expected, especially in post-apocalyptic stories. Hooper describes the town as a "Western, almost Asian fusion" and the sliding guitar music completes a very Firefly feel. He assures us that, while this town feels that way, the other settlements all have their own character and personality. Wellspring gets its name from its water source below ground, and after exploring the town a bit (checking out the mechanic where you can buy parts for your buggy and a minigame where you can bet on holographic sheriffs and mutants) an alarm starts to sound from the well control room. We go to investigate and the well manager tasks us with going into the well to prevent a gang from poisoning the water. The bandits are called the Ghost clan and, predictably, they all have white pasty skin and attack with agility and grace. The combat shows off some of the fun toys that Rage offers. You have a crossbow, and the well manager gives you a new ammo called an electrobolt. By shooting this bolt in the wet atmosphere of the well, you can shock the gang members dead. Later on you come upon a group of gang members all huddled close together. This is a perfect place to use your RC car bomb, which the demonstrator throws down and races in close. "Who's driving that?" says one of the Ghosts. BOOM! Hooper tells the gathered game journos that these items can be built by finding or buying recipes and then assembling them through acquiring the necessary parts. We didn't get to see the crafting interface, but the demo did show off some nifty items like a sentry gun and a spider-like drone that goes around shooting enemies. The demo skipped ahead to show off a few other locations, but the last scene was the most memorable. I won't ruin it for you - I get the feeling that it's something that would be better experienced for yourself - but it was a clever use of a classic story-telling technique. That's not a knife, now that's a knife! The tech of Rage is effective, and the atmosphere and story of the post-apocalyptic landscape may feel a bit overdone, but it, too, is effective. When it comes out on Xbox 360, PS3 and Windows in 2011, I could definitely see it being a big hit and franchise-starter for Id.